That's quite an adventure! It's coming up to using firewood season here too. We've been stacking it in all summer, just from cleanups of dropped branches etc. 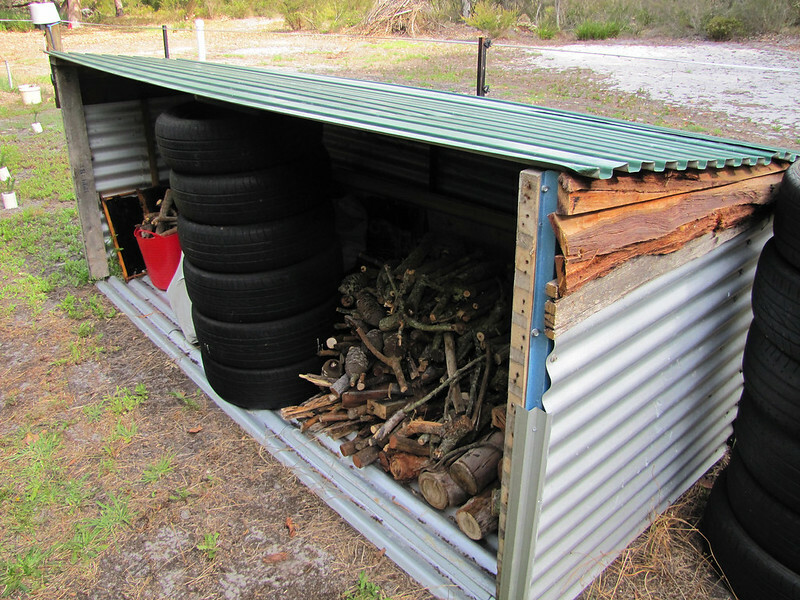 We don't need a lot though to get through winter, so the wood shed is small. A note about the tree all this wood is coming from. Before it got blown down by the last typhoon, it was a big, beautiful tree down by our creek. It looked much larger than it really was. It was actually a medium size tree, with a couple smaller trees of different species growing so close they looked like the same tree. The whole thing was covered with parasitical plants of several types, giving it an otherworldly appearance. The spring that feeds the waterhole for our livestock flowed out through its' roots. I called it the kapre tree. According to the folklore of the Philippines, the kapre is a cigar smoking, tree dwelling being who is fond of playing tricks on people traveling through the forest. If you see a group of fireflies in a treetop, the local folk will tell you that the tree is the home of a kapre. The fireflies being the sparks from his cigar. Woodhaven, SueC and Knave like this. Still packing firewood. I used the packages today. I thought I could put a big chunk on each side, then just add to it till it was full. The big chunks started ripping the canvas. I settled for a few smaller pieces. We stopped often for grazing breaks. It was around 40c, or 90f. The breaks were more for my benefit. During one break, I noticed the pack cinch was hanging loose. I took it off, and everything rode just fine anyway. The horse barely broke a sweat. I retired to the shade for some ice water. The woodpile is getting noticeably smaller. Woodhaven, SueC, carshon and 2 others like this. Thanks @carshon . A horse forum member suggested the bags. I reconfigured an old, much larger pack bag into this set to fit the little horse. She has gained some weight and is not so ribby now. She still needs some top line and to fill out in the hips and shoulder area. Our caretaker, Mr. Escobar has been busy reconfiguring and expanding the nursery in the poultry area. We were losing a fair number of chicks to predators, mostly feral cats. Mr. Escobar used scrap lumber from our construction projects to build the cages. The chicks are large enough now that he lets them roam the coop during the day, and puts them back in the cages at night. egrogan, Woodhaven, SueC and 2 others like this. That is a good little horse. Woodhaven, SueC, Cordillera Cowboy and 1 others like this. I'm puppy sitting tonight. We got a couple of unexpected additions to the menagerie this week. The goodewyfe was gifted a pit bull mix. I'm not enthusiastic about that, but she got attached to it. I suppose it is here to stay. She named it Julie Ann. About the same time, our next door neighbors in town, gave us one from a new litter at their place. The critters favorite pastime is crawling under the fence to get back "home". The neighbors promptly return it. I guess it is also here to stay. It has to stay on a lead while at the boarding house. She is pretty good about staying around up on the ranch. She is a nondescript mongrel, and the goodewyfe is not enthusiastic about this one. We offered it to our house matron. But she says there are already too many dogs at her house. I named it Adobo. We've got them sleeping on old sweaty work shirts. Seems to keep them quiet at night. So far. I'm not much of a dog trainer. I've never dealt with more than one dog at a time. Wish me luck.